Learn how to create a system to successfully prospect and generate insurance leads. Product Description: This e-book was developed for insurance agents and managers needing help in developing and creating a proven lead generation and prospecting system. Since 2008 we have been helping insurance agents with sales ideas, tips and techniques. Over the years, more than any other subject, we have received numerous requests asking for help on how to create an ongoing prospecting system that can generate insurance a continuous supply of leads. 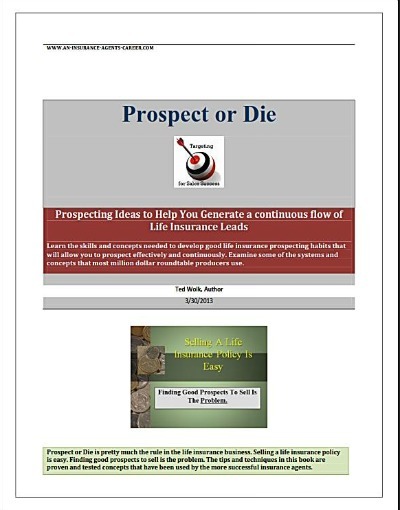 Recognizing the importance of this subject, we have created this unique one of a kind special e-book called "prospect or die." This prospecting and generating sales leads e-book is a copulation of the different articles on our website, plus much more. The objective of this e-book is to provide you with a work book that provides proven tips and useful techniques on generating insurance sales leads. it provides you with field tested "real world techniques" that they don't teach you in home office schools. Keep it on your desk as a daily reminder and resource. It has over 39 pages of techniques, tips, scripts and different ideas as well as proven and tested concepts to assist a producing agent in developing ongoing prospecting systems and how the right mindset can make a world of difference. For managers, this would be a great new agent training tool. Chapter1. Why Good Life Insurance Prospecting Habits Makes Your Job Easier. Chapter 2. Understand The Prospecting Ladder, Generate Less Phone Calls and More Income. Chapter 3. Four Ideas to Generate Life Insurance Leads. Chapter 4. The number one skill an insurance agent must master to be successful. Chapter 6. Generating Life Insurance Sales Leads By Using The Referred Lead Card System. Chapter 7. The Client Appreciation Dinner. how it works and review a sample agenda. Chapter 9. Fixing the producer’s prospecting problem. Chapter 12. About the author. To order, Just click the add to cart button. order your copy today at this low introductory price of $9.95 and download it for quick and immediate access. Using just one of the techniques shown in this prospect or die e-book will pay for this e-book 100 times over. See order page for details.